the quality iron will hold your heavy, bulky or large wine bottles without worrying a bit that it can fall and break. for small space bathrooms or apartments without a spare linen closet, you will no longer get frustrated when everything is hard to find, disorganized and cluttered. 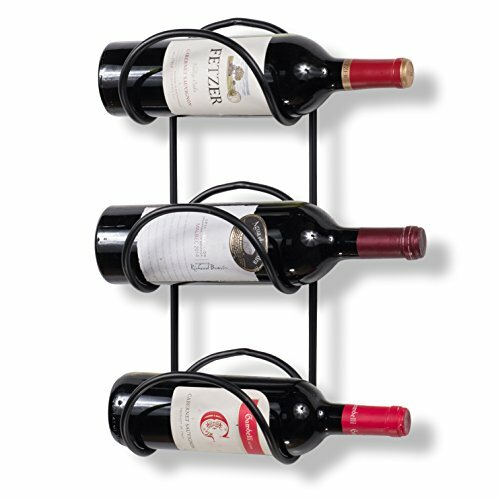 Marvelous Gift Idea: The wall mountable iron wine bottle rack makes the perfect gift for a housewarming or Christmas. Make someone special happy and decorate your kitchen or dining room wall with a classy and timeless piece. Wine Rack Dimensions: 16" x 6" Bottle Width 5 1/2"